QuickBooks has made life immensely easier for you, hasn’t it? Operating your pool and spa business is simply better when you have a software you can use to catalogue customer, equipment, and accounting information. Well, we have news for you. QuickBooks is about to get even better. Smart Service functions as an add-on to QuickBooks that provides scheduling and dispatching. That way you can manage your operations from all sides and be prepared for the biggest of waves. Carpal tunnel is a serious issue. Why risk your health typing the same information over and over again when it’s already in QuickBooks? QuickBooks data automatically populates new work orders to drastically cut down the amount of time you spend filling out information. Your schedule links up with QuickBooks to make scheduling and dispatching easier so your business can run smoother and more effectively. Building and maintaining pools and spas requires trust from your customers. Establishing customer relationships requires consistent quality work—starting from the scheduling and dispatching. If you don’t schedule a job with the full understanding of everything going on, you run the risk of having to reschedule that appointment. When every client is a schedule change away from becoming lost business, you know that you should put care into that process. When you use Smart Service pool and spa service software for QuickBooks, you can schedule and dispatch with gusto. No more playing phone tag between your customers and technicians to determine a time. No more lost customer data and missing work orders. With the Smart Service mobile app, your pool and spa service technicians are prepared for everything. They can access notes from previous jobs at the same location. Our pool and spa service software for QuickBooks uses the mobile app to connect to the office. You can schedule jobs for your technicians even when they’re in the field. Using GPS, your technicians can create optimized routes for their jobs and you can keep track of their whereabouts. Your technicians can also create invoices, complete forms, and collect payments because of Smart Service and QuickBooks integration. 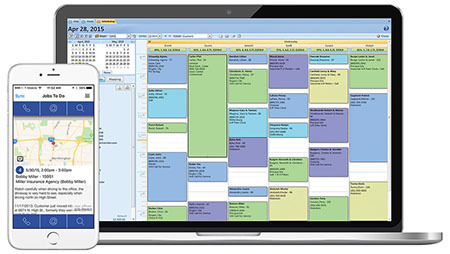 Streamline your pool & spa service business operations. Why not get your feet wet before diving into the deep? Swim past your competition with this pool and spa service business advice!